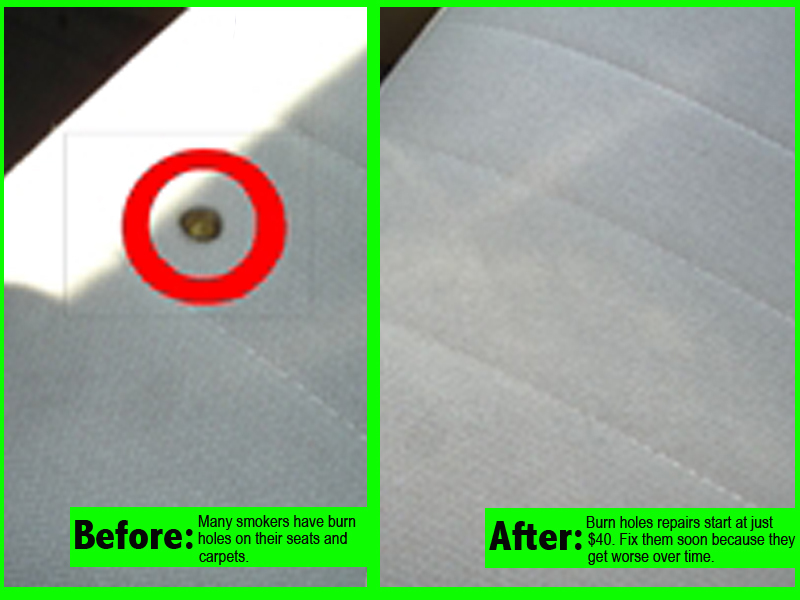 If you are a smoker, or perhaps the previous vehicle owner was a smoker, chances are you’ve experienced some burn holes. Burn holes appear in many places throughout your vehicle and no matter where they show up, the Interiorz division at Ultagloss can repair them. A burn hole in the seat of your car is annoying, especially in the driver’s seat. Things catch on it which can make the hole even bigger. Interiorz can repair most burn holes at a starting price of $40. Whether you have a cloth, vinyl, or leather seat, we can repair the area; just stop by for a free estimate. Burn holes in the carpet are unsightly and lower the value of your automobile. There are options to repair the burn holes without replacing the carpet. Interior repair specialists have the experience and precision necessary to completely repair the burn hole in the carpet of your car. Have burn holes in other places? Click here to see our burn hole repair services. A vehicle’s headliner is made of a thin material so the heat from a cigarette can singe the thin material almost immediately. It’s also very easy to bump a cigarette against the fabric when ashing out a window. These can be repaired without replacing the entire headliner and repaired at a fraction of the price. Our professionals can help ensure the damage is hardly visible. Dashboards, armrests, interior panels are all subject to burns. Our Interiorz technicians can fix several damages to dashboards, steering wheels, and other hard interior surfaces.